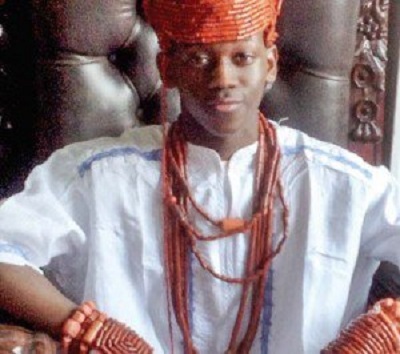 Teenage Chukwuka Noah, who was installed Obi (king) Akaeze I of Ubulu-Uku Kingdom in Aniocha South Local Government Area of Delta State after the murder of his father, tells NOSA AKENZUA how he plans to rule the kingdom. When exactly did you know that you would succeed your father as the king of Ubulu-Uku Kingdom? Kingship is not like chieftaincy titles, it is ordained by the Almighty God. The time I would succeed my father, Obi Akaeze Edward Ofolue III, was not known to me until the unfortunate incident in which he was kidnapped and then murdered by gunmen in January. The subsequent ascension of my father’s throne was a decision from God and I appreciate Him for the decision. Are you not afraid of suffering a similar fate? My father’s death was shocking and I pray such will come my way. The Almighty God will protect me and the people of Ubulu-Uku Kingdom. My father’s killing was shocking and I still ask why his killers were so heartless to him. I seek protection from the Almighty God and I am sure that He will protect me. How did your mother and siblings prepare for your ascension to the throne? With the support of God Almighty, my family members did their best. A lot of them also ensured that they embraced peace and joy for me to be on the throne. Do your schoolmates and friends still relate with you the same way they did before you became king? My relationship with my friends and schoolmates still remain the same. They are still my friends and schoolmates. The only difference now is that I am a king by the divine grace of God. They are aware of the present position of things and also know the honour a king deserves. How do your family members relate with you now that you have become king? They are my people and they relate with me well and as a king. I owe them a duty to recognise that they are my family members and as well, they know I am a king. What would you miss most about your life now that you are a king? Thank you. I am a very reserved person. I also have an unshaken belief and trust in God. I worship Him in reverence too. Now that I am a king, I will miss relating with my peer group in the open as I used to do in the United Kingdom. I used to visit my friends at will. I will also miss that. Notwithstanding, I intend to ask more questions, listen to my people and strive hard to better their lives. I will ensure I am better guided in order to give the best of my capacity. Well, things will follow one thing at a time. For now, my focus is on my studies in the United Kingdom. I am going to ask God to lead me when I want to do that. My first role model is the Almighty God. Then, I see my parents as my guardian angels. I choose God first as my role model because He is the giver of life. He is the one that determines everything in life. For my parents, it is because of their honest and reserved nature and for being able to distinguish themselves from others. I will leave that for Almighty God to help me to achieve. I cannot do anything without His power and guidance. But as a desire, I honestly would want to be remembered as the best king who ruled his people with prosperity, fear of God and love. What is your message to the people of your kingdom? Well, considering the heart-rending incident in which my beloved father lost his life, I will try to take everything slowly. I will also want them to know that God is with our land. I am certain that God is with the people of Ubulu-Uku who are my wonderful people. God will continue to protect them and lead them right. He will grant them mercies and bless them with His uncommon grace to succeed. I will carry on during this difficult period and protect the good people of Ubulu-Uku by seeking God’s intervention to lead me well. I pray that God will never leave the people of Ubulu-Uku. He will give them the grace to succeed in the name of Jesus. I am 17 years old and not 15 years as widely stated. What career do you intend to choose? I had wanted to be a medical doctor but the unfortunate incident that led to the death of my father changed the process. When it was announced that my father had been killed, I had no choice than to heed the call to succeed him. It is painful that my father passed on in an inexplicable circumstance. But to the glory of God, I have succeeded him in ruling the Ubulu-Uku kingdom. What do you think is going to happen to your studies now? I am going back to the UK to continue my studies. My uncle has been appointed to stand in for me as the regent till I return. It is really historic for the people of Ubulu-Uku who I hold in trust as my people and I ask the Almighty God to see me through the period of my studies. I promise to do the will of my people. I also ask the Almighty God to support me and bless the people of Ubulu-Uku beyond their expectations. I also beseech Him to bless the Kingdom and make my reign peaceful.